Easy Planting- A good time to plant is the first or second week in March. 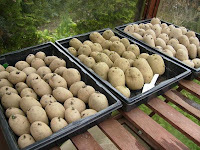 Potatoes can be planted using a large dibber or by making a trench the width of a spade 6-9" deep. Sprinkle with calcified seaweed or Maxicrop fertilizer. Places earlies about 12" between tubers and place main crop about 15" between tubers. The rows should be approximately 2ft apart and gently fill each trench and wait for the new shoots to appear. Now is the time to earth them up, using the soil between the rows. If the weather looks like its going to be frosty, keep earthing them up and when they are too large, cover them with fibre fleece which should keep two or three degrees of frost off. 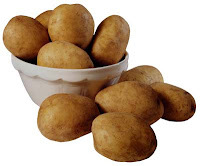 Rotation- Potatoes have a fairly wide range of minor pests and one or two major pests. Reasonable rotation of crops in the garden is important to keep the pest numbers down to manageable levels. Pests which do not have access to potatoes have a limited survival time. Ideally the same part of the garden should only be planted with seed potatoes once every 3-4 years because of these diseases. Potato barrels and larger pots can be used to plant seed potatoes, however sometimes compost can become very compressed due to watering or wet weather. This can be remedied by mixing some form of perlite or organic matter into the soil. This will stop the compressing and not harm the tubers. Use containers with a diameter of at least 30cm (12in) to allow plants to develop. Make sure that there is adequate drainage in the container and then place around 10cm (4in) of compost mixed with perlite in the pot. Add the seed potato and then cover with around 5cm (2in) of compost, continue this process at intervals until the container will not hold any more compost. When your plant is ready to harvest you should find that your container is full of potatoes!! This method of growing potatoes is good if you have a small garden, do not have a Vegatable Bed or wish to enter a Vegetable Growing Show as it minimises blemishes on the potatoes.